A mass of skyscrapers make up the skyline of downtown Detroit in Michigan, USA and as dusk takes over, the area becomes brightly illuminated. The reflections of the lights on the buildings and along the waterfront, shimmer across the calm surface of the Detroit River. The GM Building or Cadillac Place and the Renaissance Center are some of the prominent buildings making up the downtown core of Detroit with the Detroit River separating Canada from the United States. 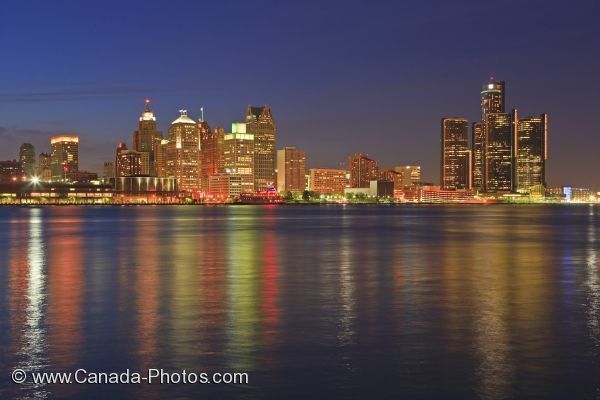 The illuminated skyline of Detroit is best seen from across the international border in the southernmost city, Windsor, Ontario. Skyline of Detroit, Michigan, USA seen from the city of Windsor, Ontario, Canada at dusk. Picture of the illuminated skyline of Detroit, Michigan as seen from across the river in Windsor, Ontario at dusk.